Di's Scrapbook ShopJust-FabuliciouswithKirsty Kitchener : Di's Scrapbooks is up "FOR SALE"
CLEARANCE ALL PAPERS & CARDSTOCK HALF PRICE. Until sold. Have a great day. Pin It Now! All the best for your retirement Di.. I hope the sale all goes well.. and I know you will still keep scrapping so we will still see you around the blogs!! Wow! Eight years ago I remember walking in and seeing the last minute preps going up ready for opening, seems like yesterday. Im sure you certainly have made a statement with your business as it has always had a professional and amazing range of supplies for the scrapbooking community. Best wishes hun for the retirement side of things and as Lizzy said we hope to still see you around the blogs with your amazing creations. 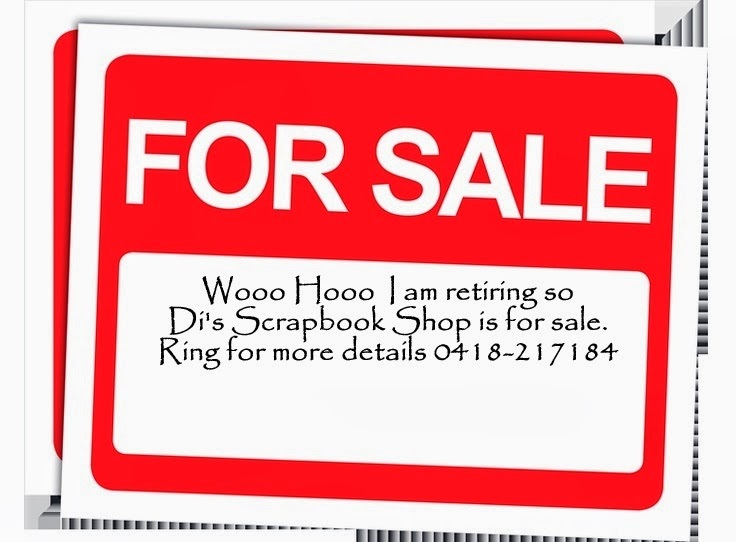 Di's Scrapbooks is up "FOR SALE"